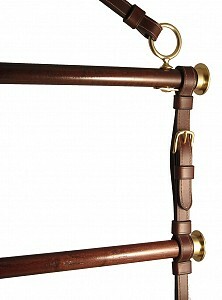 Blanket Hanger - Presentation Style with Leather and Brass Fittings. Wow! This blanket bar stopped us in our tracks the first time we saw it. 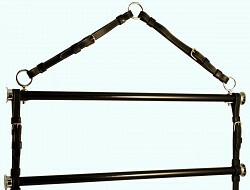 Four 30" dowels connected with 3/4" leather straps of fine European leather. The wood dowels, stained Cordovan or Black match beautifully the Australian Nut or Black color of the leather. Brass hanging ring, brass hardware, elegant brass terrets and custom made brass "end caps" make this rack a beautiful addition to any tack room. Check here if you would like us to gift wrap this item. No charge! You don't have to log in to see our site!